This tutorial is an essential guide to the tilt-shift lens, a study of the tilt-shift lens, or architectural lens, as it is also called. 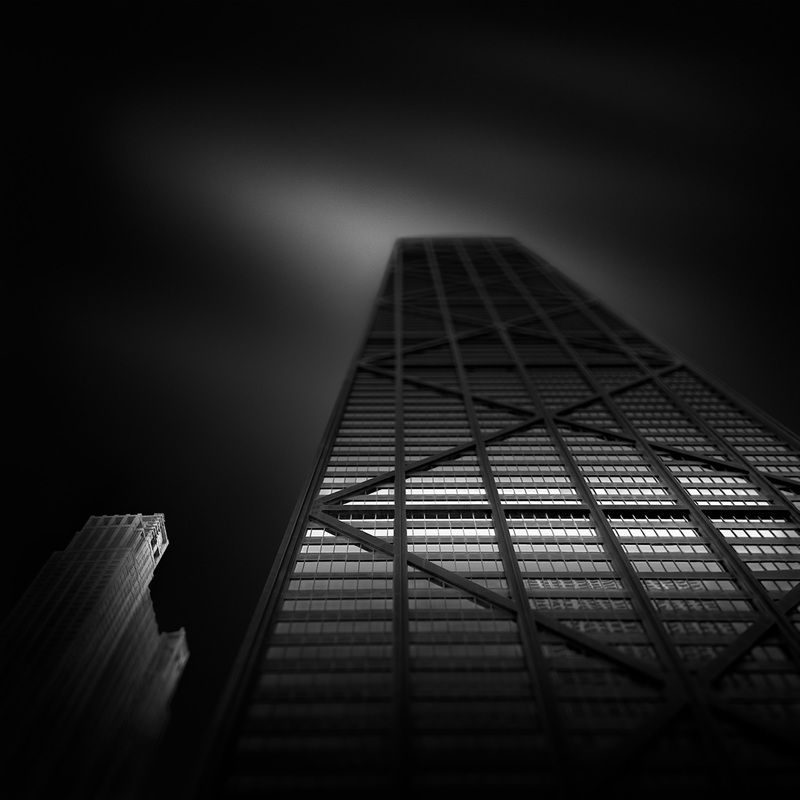 This tutorial constitutes a fragment from the extensive tilt-shift lens study I present in my book From Basics to Fine Art – Black and White Photography – Architecture & Beyond, that you can find on my webstore at the link above. You can find the entire study in the chapter “The Tilt-Shift Lens as Main Tool in Architectural Photography”. Also hands-on demonstrations and explanations with case studies on how to use the tilt-shift lens in architectural and long exposure photography, together with more other resources and tips you can find in my video tutorial Long Exposure, Architecture, Fine Art Photography – Creating (en)Visionography that comes with a black and white processing ebook. 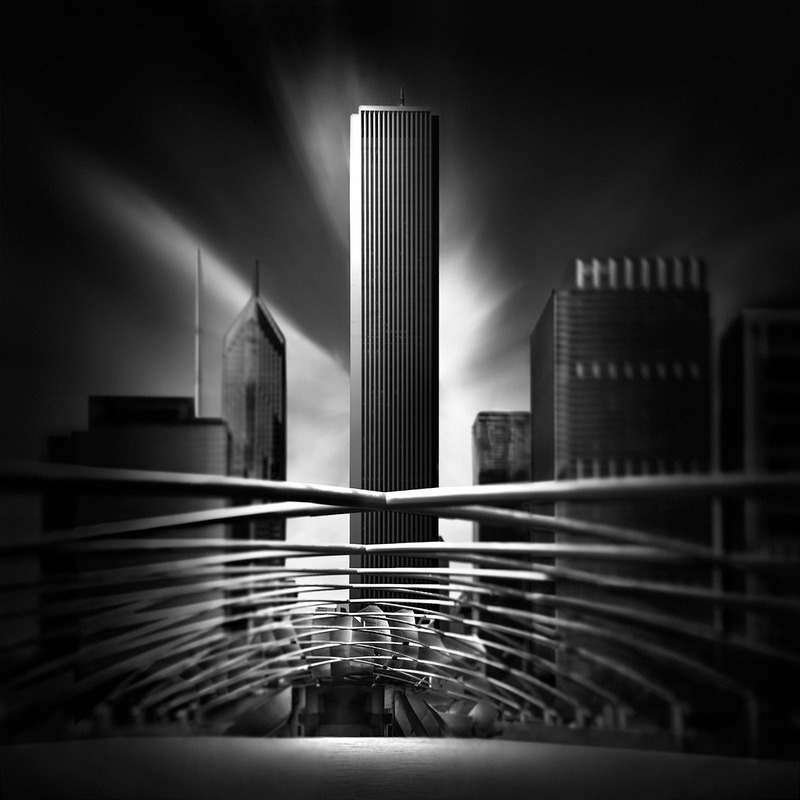 The fine art architectural images shown in this tutorial have been shoot with a Canon 5D MKIII camera, a Canon tilt-shift lens TS-E 24mm f/3.5 L II, using neutral density filters Formatt-Hitech ProStop IRND, and were processed using Photoshop, Lightroom and Topaz B&W Effects, DeNoise, Detail and ReMask. There is a certain mystery around the tilt-shift lenses among those who have not used one yet. At the same time, I can notice among many photographers a sort of awe combined with inhibition when it comes to talking about this lens and especially when it comes to shooting with it. From what I see around me, this is the least understood lens among the DSLR lenses and the one that is the most underused, meaning that it is used by many well below its full capacity and capabilities. This happens mostly because the tilt-shift is a very different lens comparing to the regular lenses, a lens not so easy to use, being mostly manual and a lens that is considered professional, while in reality it could be used by amateur photographers as well if they want to get high-quality results. In this tutorial, I will try to elucidate the mystery created around the tilt-shift lens and to bring it closer to the photographer that does photography as a hobby, but also to show to the professional photographer how he could make better use of this piece of exceptional glass. However perfect this lens might be, it is still only a piece of equipment, therefore the first thing I want to state, before even touching any technical matters, is that this lens has to be the extension of your hand, of your mind and soul, the extension of your artistic personality and the tool that can make your vision come true. Only in that case will it help you create good photography, when you will use it as a tool to express yourself and your vision and not only because it is a remarkable lens. One of the main tools for an architectural photographer is the tilt-shift lens. The most important quality of this lens and what makes it so popular and needed in photographing buildings and interior spaces, is the fact that it can keep the verticals of a building parallel, thus presenting the object as we see it and not with the verticals converging, as a normal or wide lens would capture it. In other words, the use of tilt-shift lenses “removes” the wide-angle lens distortion, or rather it does not introduce it in the first place. It removes the “keystone effect”, as the convergence of the verticals in case of tilting the camera is otherwise known. We will see further in this chapter why this is happening, how this is possible and how to control it. Another important characteristic of this lens, a characteristic that makes it ideal for the architectural photographer, is its exceptional clarity, sharpness and lack of chromatic aberration, that are not equaled by the more common lenses. The superior sharpness and high-quality image is one of the characteristics of the prime lenses, as all tilt-shift lenses are, and more specifically of the tilt-shift lenses, due to their construction and exceptional glass quality. 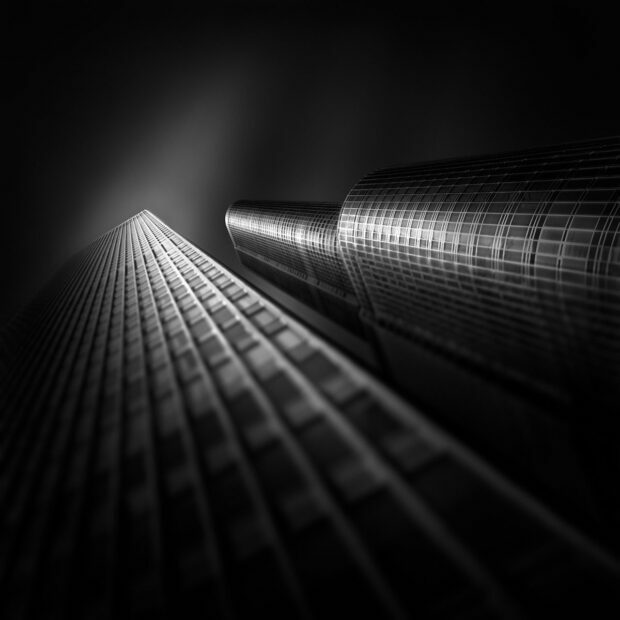 You can read this article I wrote if you want to consult a more in-depth tutorial about the creation of a fine art architectural photograph using a tilt-shift lens. The main and commonest use of the tilt-shift lens is to control perspective by means of the movements relative to the sensor plane that this lens can perform, as opposed to the classic lenses, whose parts only move to focus and to zoom. A tilt/shift lens can be easily compared with a small view camera, a camera whose lens can also rotate relative to the film/sensor plane and not only move forwards and backwards as in the case of a normal lens. The movements of the tilt-shift lens enable the photographer to modify the lens plane independently from the camera sensor (or film) plane by TILTING which means tilt and swing movements (rotating relatively to the sensor plane) and by SHIFTING, which means rise and fall movements (moving parallel up and down or left and right relative to the sensor plane). 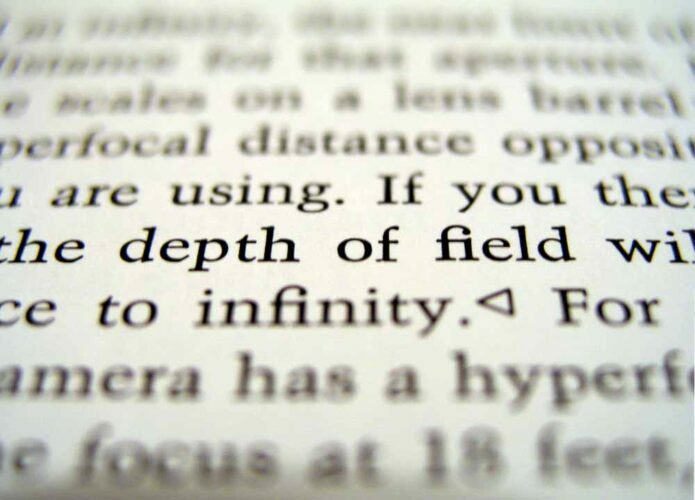 Some tilt-shift lenses also rotate around their own axis, giving more freedom in positioning the field of focus. The tilt movement is used to control which point of the image is in focus, while shifting controls the parallelism or convergence of the vertical lines when it is done upwards and downwards. How much a tilt-shift lens can tilt or shift? 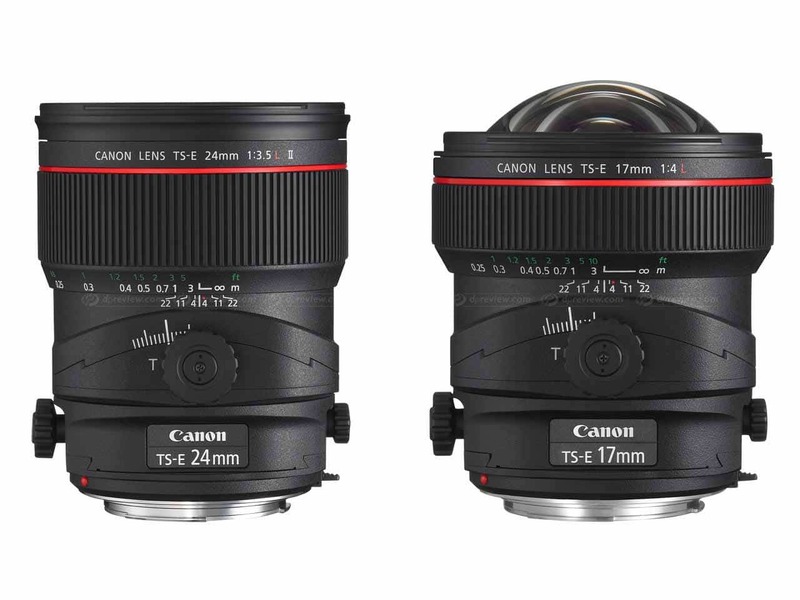 For instance, a Canon TS-E 24 mm, which is one of the most popular tilt-shift lenses for architecture, can shift up to 12 mm on either side, and it can tilt up to 8 degrees on either side. The other tilt-shift lenses available have similar values. Note: It is useful to also mention that, if the tilt-shift lens is not moved relative to the sensor plane (not tilted or shifted), it functions like a normal prime lens from all points of view. 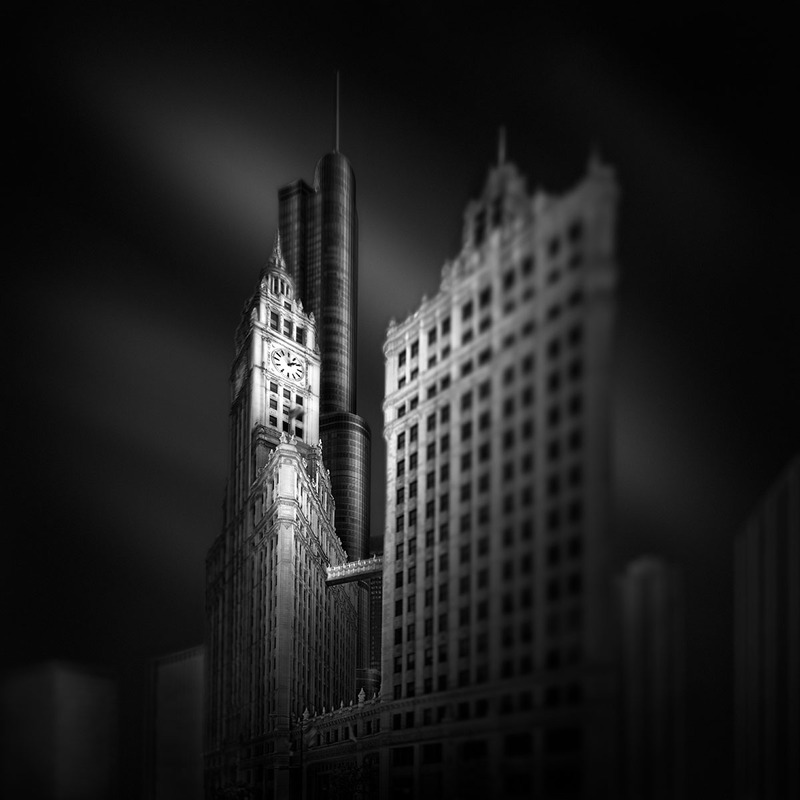 The first use of a tilt-shift lens for architecture is to control perspective, namely to control the keystone effect. The first thing you need to keep in mind when shooting architecture with a tilt-shift lens, in order to have the verticals parallel, is to always place the camera in a parallel position with the plane of the building, thus perfectly vertical. Unless you do this, the tilt-shift will not be able to remove the keystone effect. Then, after you compose your shot so the vertical are parallel and you have the needed scene in the frame, you can start to slowly shift the lens upwards till you include the entire building in the frame and also avoid the convergence of the verticals. You need a bit of practice to learn how to compose so you get the final image exactly where you want it after shifting the lens, but experience comes with time and you will very soon feel very confident composing with a tilt-shift, having the final image in mind even before shifting the lens. 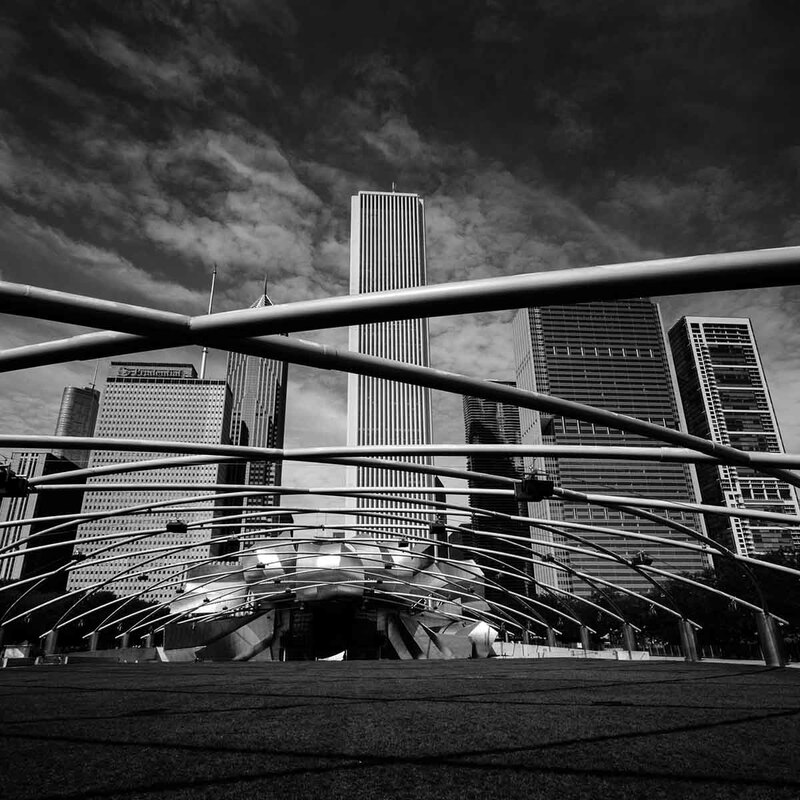 In the first image below, an example of a photograph I shot with a wide angle lens and the camera tilted upwards so to cover the entire height of the buildings, while in the second image I used to shoot the same scene a tilt-shift lens shifted upwards to capture the height of the buildings. You can observe the keystone effect in the first image (the converging verticals), while in the second image the verticals of the building remain parallel because the lens was shifted upwards, thus the sensor plane was kept parallel to the building plane. Since this is an essential guide to the tilt-shift lens, we should also talk about the functioning principle of a tilt-shift lens. For a more visual explanation of how a tilt-shift lens works in practice, you can look at the image provided as an example so you can understand how this process unfolds. In the case of a normal lens, the image circle is only slightly larger than the sensor, while in the case of the tilt-shift the circle is much larger, so it allows for all the movements the lens can do, as can be seen in the image. When the lens is tilted or/and shifted, what happens, in essence, is that the image of the scene in front of it is projected onto the camera sensor. The resulting image is an image that is slightly different in each of the positions of the lens, and that always inscribes in an imaginary circle created by the movements of the lens in its extreme tilt or shift positions. This imaginary circle is called the Image Circle and it covers the entire field that the lens can capture out of the scene in front of it. 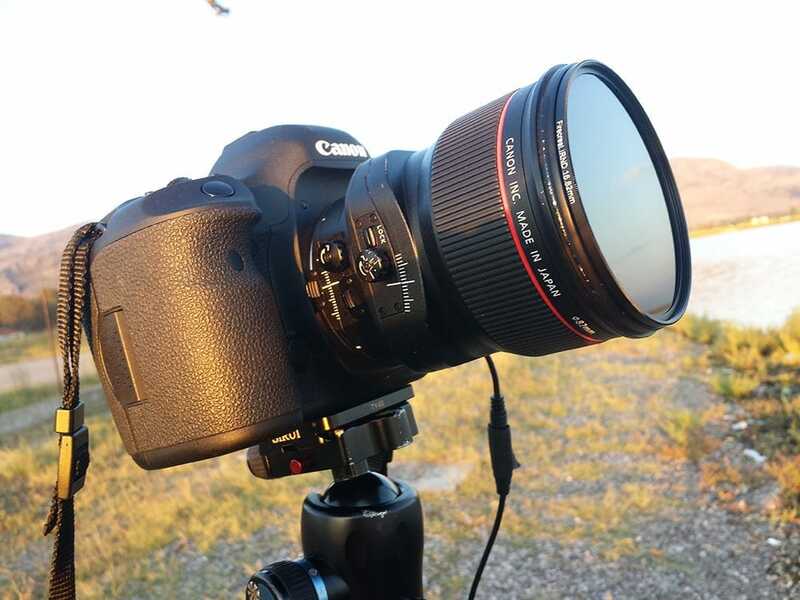 Therefore you can see now that the lens can only cover a limited area of the scene in any direction and this area depends on the maximum possible displacement of the lens related to the sensor’s position. Image circle and positions of the final image inside it, as the camera shifts in all directions. You will only be able to focus manually, since the mechanics of the tilt-shift makes impossible the use of an auto-focus system in this lens. By using the tilt function in a specific way described below we can create front-to-back depth of field (DoF) meaning we can keep everything in focus, no matter the aperture, even at f/3.5 of f/2.8. – Mount the camera on a tripod. – Set your aperture at f/8 for best quality of the image (you can also set a different aperture if needed). – Open the Live View of the camera. – Choose two important subjects (points) that you want to be in focus, one in the foreground and the other one in the background. 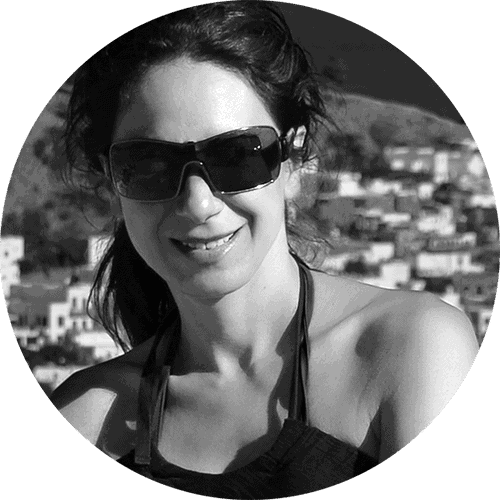 – Focus on the closest point you want sharp in the scene (the foreground subject you chose). – Tilt the lens downwards slightly till the farthest point in the scene is in focus (in general a tilt of no more than 1-2 degrees will be enough most of the times to bring everything in focus). – Go back and forth 2-3 times with fine-tuning, while zooming up to 10x in Live view to check out the focus, till both subjects (in the foreground and in the background) are in focus, and the entire scene will then be in focus. How to deal with this? It is not very difficult, just meter your scene before tilting or shifting the lens, while it still works like a normal lens from the point of view of the movements it makes. At a first glance, shooting long exposure with a tilt-shift lens is not different from doing it with any other regular lens. The first aspect and issue is related to the way we will focus and meter the light so we can calculate the needed exposure. 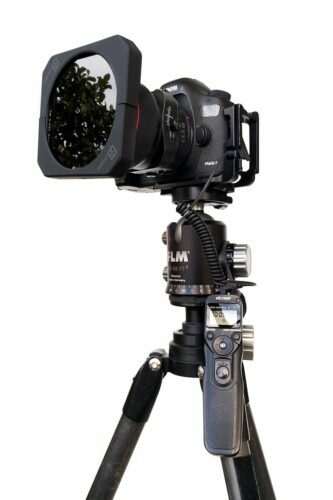 In the case the lens will be used tilted or shifted or both, just as in the case of short exposure, the light metering will be done before tilting/shifting the lens. This needs to be done so the light meter does not get confused by the light that may enter through the small openings created between the tilted/shifted parts and reach the sensor when tilting or shifting the lens. The second aspect and issue is the light leakage that can occur in a tilt-shift lens during a long exposure. Just as in the case of metering light in a regular exposure with a tilt-shift lens where, if tilted or shifted, the lens allows the light to leak in and confuse the light meter, the same can happen in the case of a long exposure because of the extended time the lens is exposed to light while not being sealed properly and meant for use in long exposure photography. It is not difficult to avoid light leakage. You will use the same principle you use so the light does not leak into the camera through the viewfinder: cover it. Thus, you will cover the lens in the case of a long exposure with a black cloth that will need to have the shape of a sleeve and be rather thick so it does not let the light inside the lens. You can also cover the entire camera with a black cloth and just leave uncovered the opening of the tilt-shift lens. Another way to avoid light leakage, this time the light leakage that occurs through the square filters, is to use circular ND filters instead of square, if your shooting style permits it. You can use either a combination of 10+6 or a 10+3 stops, or even better use the new Formatt – Hitech Firecrest 16 (or Firecrest 13 – available from October 2014) that will help you avoid any light leakage and also avoid vignette. You can read at the link an extensive review of the new Formatt – Hitech Firecrest 16 IRND filters that I recently made. Here you can see the circular Firecrest 16 IRND filter mounted on my Canon 24mm T/S lens and how I deal with light leakage, by covering the camera and using a circular ND filter. 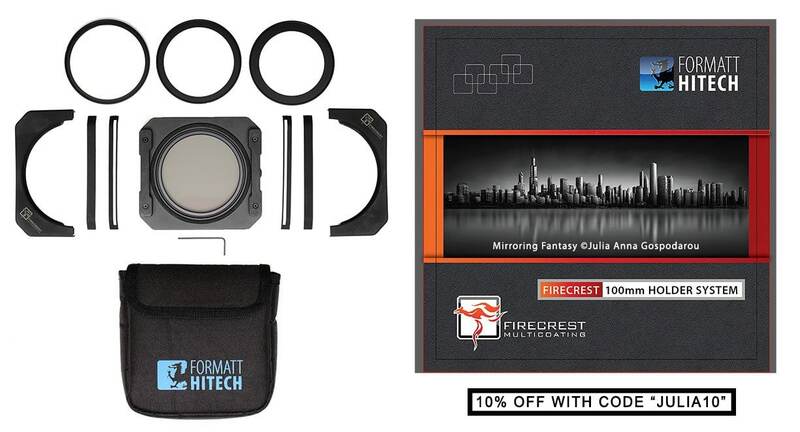 An alternative to the circular filter, to avoid leaks through the filter is the Firecrest 10mm Anti Lightleak Holder Kit an advanced holder that will eliminate the light leak you can experience when shooting with square filters. 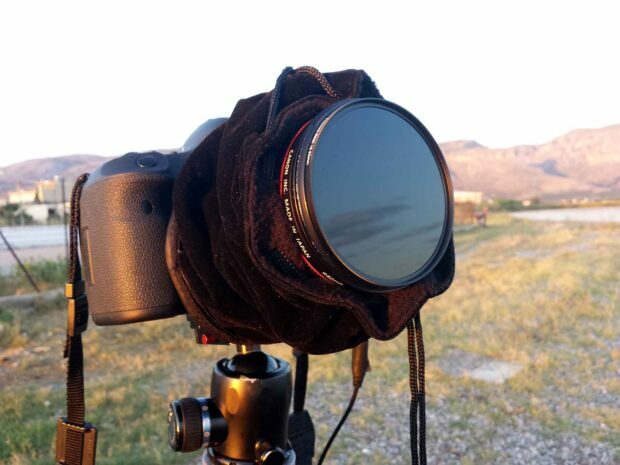 The holder also contains a polarizing filter, and has incorporated a rotation system for this filter which is very practical and useful. Here is how this kit looks like below and you can get it, like all other Formatt-Hitech products with 10% discount with code JULIA10. You can read much more about how to shoot long exposure with a tilt-shift in my Long Exposure Photography Extensive Tutorial, a complete guide to this fascinating technique. Shooting long exposure with a 17 mm tilt-shift lens, such as the Canon TS-E 17 mm, creates a serious problem for the long exposure photographer. 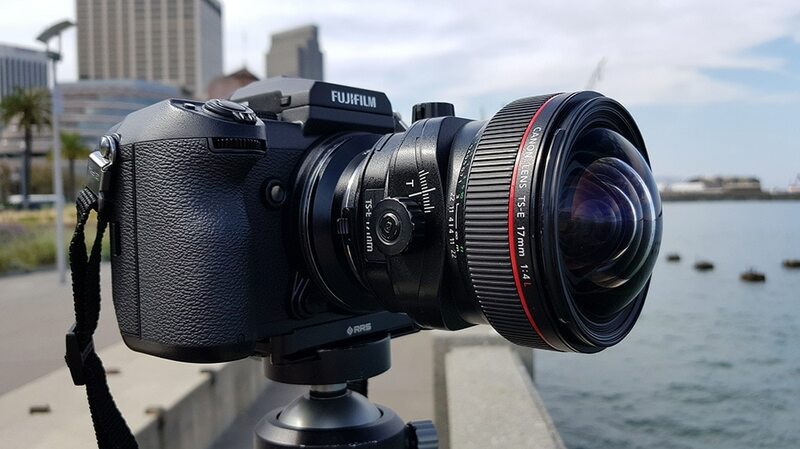 The same problem all the ultra-wide angles create – the fact that their front glass element is so bulging that it does not allow the placement of a neutral density ND filter directly onto the lens. Therefore these lenses cannot be used with screw-on ND filters but only with filters placed on a holder and not even with normal holders where the filter is placed in the same plane with the holder, but with special protruding holders, as for instance the Formatt-Hitech Lucroit holders that allow the placement of the filters at a distance from the exterior ring of the lens where they are fastened. 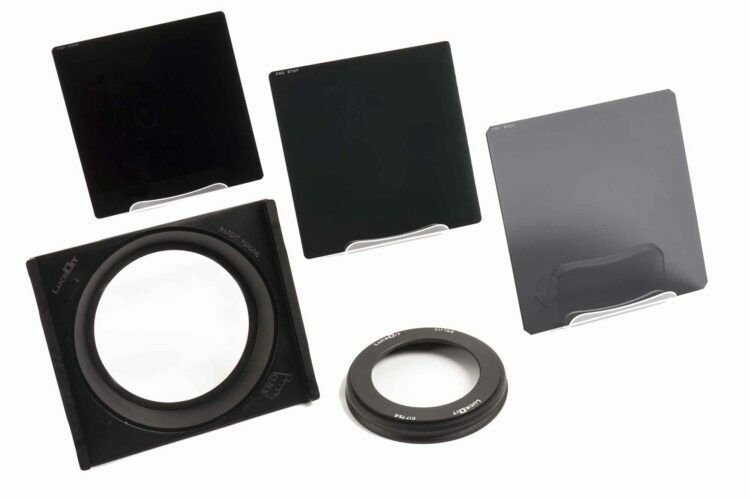 You can see in the image below the Formatt-Hitech Lucroit holder together with the ProStop IRND square filter kit, consisting in a 10-stop, a 6-stop and a 3-stop ND filters. Using blur to shoot architecture is surely a non-conventional way of shooting this kind of subjects and not what you would use in a professional commercial architectural assignment. But as far as a fine art approach is concerned, if you already read my Guide to Vision in the book From Basics to Fine Art, you will know that any means, technique or approach is good as long as it helps you express yourself and give shape to your vision. The tilt-shift blur is one of these techniques that help me do this. You do not need to use blur if it does not suit your artistic representation of the world, but in my case it does, thus the need I felt to create the series Fluid Time where I explore the world through using the tilt-shift lens and its specific blur. I find that this kind of blur serves my vision because it reminds me of the eternal mystery of the world and the so many different ways in which one can see it, also the so many different ways that one could live in this world; even if we choose only one way to see, to think, to live, the options are always there, like in a dream. In a way, the blur a tilt-shift lens can create is a very suitable tool for me to express this multifaceted, multidimensional world. What I try to create by using the tilt-shift blur is to suggest a symbolic connection between different worlds. I imagine the buildings I photograph as being each of them a different world that cannot come in contact normally, since buildings cannot move or approach each other in a physical way. By using the blur I aim to “blur the borders” between these worlds and suggest a possible connection between these worlds. It is a metaphor for the inter-human connection especially in the age of the internet, when people try to come together and have a connection with each other even without being able approaching each other in a physical way since they may be far away from one another. Of course, this is just my vision, you will most probably have a different one, but you can still use the tilt-lens qualities to recreate your vision in a photograph. The great thing about using a technique is that it has no life of its own and it can be used to express many different visions and ideas, depending on the artist using it. Therefore you are free to use it in a totally different way or not use it at all. All options are just as good. Now, to get to some more technical aspects, the blur that you can create using a tilt-shift lens, is different from the blur (bokeh) we find in a regular lens. The texture, the density, the intensity and most important of all, the placement and shape of the blur. Due to how the field of focus is created in the case of the tilt-shift lens, the shape of which influences the shape of the tilt-shift blur, the latter will have a rectilinear shape across the image, just as the shape of the field of focus, as opposed to the rather circular blur (bokeh) a regular lens creates. This is a vital characteristic to understand because it changes the approach to the image and to its composition radically. It needs a different compositional approach to create an image where the blur will be circular, thus centered in a point, and a different one in the case of the rectilinear blur of the tilt-shift lens. As I was saying in the beginning, as an addition to this essential guide to the tilt-shift lens, much more information about what a tilt-shift lens is, about how it functions and how to use it in different types of photography, with details about long exposure tilt-shift photography and other ways you can use the tilt-shift lens in your work, can be found in the book From Basics to Fine Art – Black and White Photography , a book we wrote together with black and white fine art photographer Joel Tjintjelaar and that is an extensive study of black and white photography, theoretical and practical, including our processing techniques also, tips and tricks but also theoretical and even philosophical views on photography and that already had a big success and enthusiastic reviews from many specialists in fine art and black and white photography. Also hands-on demonstrations and explanations with case studies on how to use the tilt-shift lens in architectural and long exposure photography, together with more other resources and tips you can find in my video tutorial Long Exposure, Architecture, Fine Art Photography – Creating (en)Visionography . 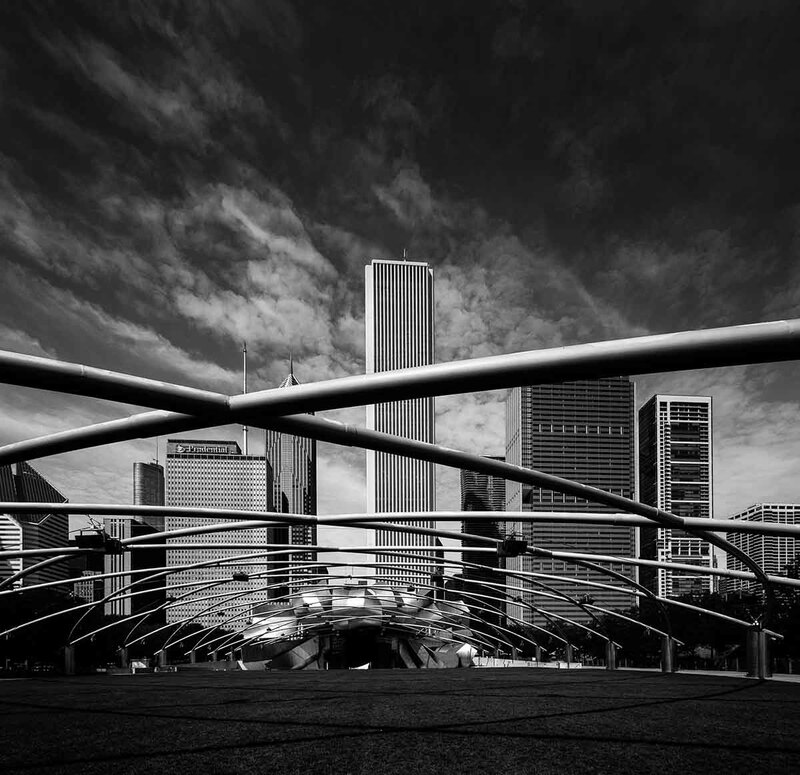 Posted in Gear Software Reviews, Most Popular, Tutorials Fine Art Black and White Photography. RSS 2.0 feed. My budget only allows for the Rokinon tilt shift LENS on a canon asp-c sensor (7d mark II) any workarounds or recommendations ? Hi Steve. I’d say go for the Rokinon now and you can upgrade in the future if you need it. The quality of the lens is quite good from what I’ve seen in reviews and it will give you the freedom to use a new technique in your work. You don’t necessarily need to go to the top gear to make great photography. That’s always my belief. Good luck!